Scientists have unearthed monkey teeth that could significantly change the animals' migration history. Placed in a wax jaw, fossil teeth belonging to Panamacebus transitus are compared with those of a modern female tufted capuchin, Cebus apella, in this picture courtesy of the Florida Museum of Natural History. Scientists have long thought that monkeys first ventured from South America into North America no earlier than about 4 million years ago, when the two continents merged. But seven teeth unearthed in Panama may change that story. These monkey teeth were discovered encased in 21-million-year-old rocks. 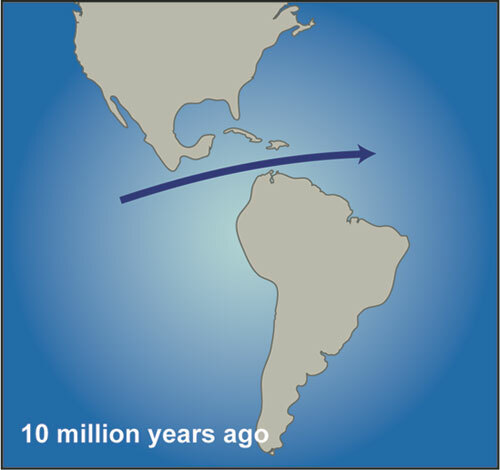 This suggests that the primates accomplished the impossible, crossing the more than 100 miles of ocean that separated South America from North America at the time. These prehistoric monkeys, which probably looked like today's capuchin monkeys, are the only mammals known to cross this watery boundary so early, says Jonathan Bloch. Dr. Bloch, the curator of vertebrate paleontology at the Florida Museum of Natural History, is the lead author of a paper announcing this find, which was published Wednesday in the journal Nature. Today the two American continents are connected by the Isthmus of Panama, the strip of land that separates the Caribbean Sea and the Pacific Ocean. But around 21 million years ago, Panama was just a peninsula extending off of North America, with the Central American Seaway separating the two continents. That body of water was thought insurmountable for animal migrations, until now. So how could monkeys have crossed such a barrier? It's unlikely that they swam, Bloch says. Instead, they likely rafted over to Panama on a mat of vegetation. "When there are events like hurricanes or major earthquakes or tsunamis, vegetation and clumps of dirt can get washed off the shore. Animals can come along with it," explains Siobhán Cooke, a paleobiologist at Northeastern Illinois University who was not part of this study. "Monkeys are pretty good dispersers," Dr. Cooke tells The Christian Science Monitor in an interview, and some monkeys have made it to live on islands. "It isn't surprising that they were able to disperse to North America," she says. Scientists think this wasn't the first time monkeys rafted across seawater. Monkeys are thought to have evolved in Africa, so "one of the big mysteries in studying monkey evolution has always been how did monkeys get to South America," Bloch tells the Monitor. Similar monkeys to the South American ones emerged in the fossil record about 40 million years ago in northern Africa. Then, between 34 and 37 million years ago, they somehow made their way to South America. But monkeys don't appear in the fossil record on any other continents at the time, so they must have taken a direct route. The vegetation raft hypothesis emerged to explain that trek. Once in South America, the monkeys dispersed across the region and established themselves as a separate lineage: platyrrhines, or New World monkeys. "Platyrrhines are a very important part of modern ecosystems in South America today," Bloch says. Today's population includes squirrel monkeys and howler monkeys. In central America today, you can find capuchins, or "organ grinder" monkeys. Monkeys were thought to have spread from the once-island continent of South America north into central America as part of the Great American Biotic Interchange, which followed the creation of the Isthmus of Panama. During that time many animals migrated across the newly formed land bridge both north and south. Opossums, armadillos, and porcupines are thought to have entered North America over the Isthmus of Panama at the time. Deer, cats, raccoons, bears, and other animals migrated south. Any migration was thought impossible before this event. But this new find "indicates that there was dispersal between the two continental landmasses prior to the complete formation of the Isthmus of Panama," Cooke says. "It changes the story of dispersal across that region." As scientists are discussing New World monkey evolution, North America is never mentioned before a few million years ago, says Bloch. But "now we know that North America plays a role in the evolution of monkeys." And it's not just any monkey, he says. "It's well-nested within the family tree of living platyrrhines." The morphology of these teeth suggest that they belong to a monkey that was closely related to the squirrel monkeys and capuchin monkeys still alive today. Bloch and his colleagues named the new species Panamacebus transitus. Not only can this new find shed light on monkey migration, but it also can say something about our own evolutionary history, says Cooke. "These are organisms that are closely related to us," she says. "They're part of our lineage. We are primates after all. This helps us learn a little bit more about what our cousins were doing, where they were, and what their evolutionary history involved."